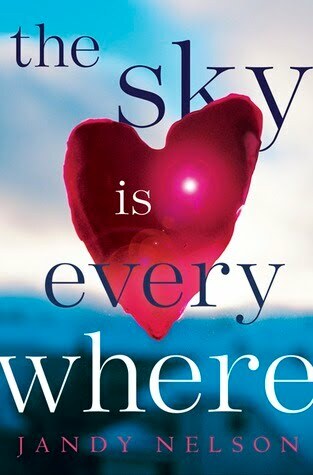 I’ve had my copy of The Sky is Everywhere since March because a good friend gave it as a gift for my birthday. I’ve heard good things about it but I haven’t had a chance to read it until last week. This was chosen as the monthly read for August in one of my Goodreads’ groups so I had to bump it up my TBR. When Lennie goes back to school after her sister Bailey passed away, she knows that nothing will ever be the same and she feels like no one understands what she’s going through except for Bailey’s boyfriend, Toby. She’s bowled over when she meets the new student at band practice, Joe Fontaine of the incredible eyelashes and grin the size of continental United States. She doesn’t understand why she’s so affected by this stranger and why he occupies her thoughts when she should be thinking about Bailey. It was easy for me to empathize with Lennie, having experienced the loss of a loved one a couple of years ago. I love how this book tackles grief and how Lennie handles hers in ways that even she doesn’t understand. The Sky is Everywhere is so much more than a story with a love triangle as the summary implies. Even if the story occurs after Bailey passed away, you still feel like you get to know Bailey through Lennie’s memories of her. I like how the book deals with loss, but balanced with that unhappiness is the sense of wonder and giddiness that comes with falling in love. Lennie struggles to cope with her sorrow and learns to accept that life goes on even without her sister. I highly recommend this book because I have a feeling a lot of people will be able to relate with Lennie and everything she’s going through. I enjoyed reading about the quirky secondary characters – it seemed like every character in this book has a very original personality. I also liked the poems scattered all throughout the book, poems about Bailey that Lennie writes in every surface that she can find. In the UK paperback edition, I’ve seen that the text is blue and it looks like handwriting in a journal and that the poems come in colored pictures that make the whole thing look like a scrapbook. I have the US hardcover edition, where everything’s in black ink. All in all, a very strong debut for Jandy Nelson and I will watch out for any other book that she writes. I stumbled upon your website in the wee hours of the morning (can’t sleep) by reading about Juliet Marillier. I have read all her current books and I am looking forward to her new book in the Sevenwaters trilogy. Anyway, I am happy I came across your blog and the fact you are Filipino. My mother is Filipino and my dad is Anglo-American. It is good you are contributing to the Filipino voice in literature. Well, I have your site bookmarked, and I will definitely read up on your reviews. I am always looking for a great book to read! Keep up the good work! Hi Sana! In what country are you based? Yay, I’m glad that you found my blog because you were looking for information about Juliet Marillier. I’ve only read her Sevenwaters books and Wildwood Dancing but I’m really curious about her other books. Oooh so you’re half-Filipino? 🙂 Do you know how to speak Filipino? Feel free to check out the rest of my reviews if you’re looking for more books to read. I usually read young adult and fantasy books. I am from Cincinnati, Ohio, U.S. and yes I am half-Filipino. I know some Tagalog and some Pampangan. My family is from Tarlac and they speak Pampangan among each other. I too, have only read the Sevenwaters and the Wildwood Dancing books. I want to read her other books too. Have you read anything by Neil Gaiman? You probably have reviewed something of his, but if not he is a really good author both of young adult books and more adult themed books. Oh it’s good that you know some Tagalog. Kamusta? 🙂 I know where Tarlac is but I’ve never stayed there. There’s going to be a new Sevenwaters book this December and then another one in 2012! She’s also writing a new YA series. I haven’t been able to find copies of her Bridei Chronicles but I hear it’s really good. Yes, I’ve read books by Neil Gaiman but I read them before I started the blog so I don’t have reviews of his books here. I do have pictures of the book signing that I attended when he went here in Manila. You put into words exactly how I felt about The Sky is Everywhere. I laughed and cried while reading the book. I guess maybe I could relate a lot to it because I’ve lost a loved one too. I’m glad you felt the same way about this one, Celina. 🙂 There really is a nice balance of happiness and sorrow in the book, right? It can make you laugh or cry, depending on what Lennie is feeling. I hope Jandy Nelson will come up with something new soon so we can check out her work. I’m jealous that you have the UK edition because it’s prettier than the US edition. But it’s okay, my copy is a gift anyway so it’s special. It’s actually because of you that I got the UK edition. You mentioned that the UK edition was much nicer, so that’s what I got. :D I’m glad you told me about it. I do hope other people pick up this book, it’s really good and I can’t stop thinking about it. Haha when you say crybaby, I think of Rayray. 😛 It’s good that you were able to get the UK edition because if I can’t have it, at least I know that a friend got it. I also told Evert to get that edition! I have a feeling more people will read this because several group members over at Goodreads are in the middle of reading it and those who’ve finished reading have all liked it. The quote you picked is a great reflection of this book. The writing was so lovely, and the mixture of the poems and romance and love and grief felt refreshing and new. Loved the poems especially and the one-of-a-kind characters. So glad I trusted Angie when she strongly recommended it to me after she finished it. I too will be watching for Jandy Nelson’s next book! I’m glad you’ve read this, Holly! It looks like you liked it as much as I did. Yes, the characters were really one-of-a-kind, weren’t they? Lennie’s grandma and Uncle Big and even Joe’s family. I’m not surprised that Angie recommended this one. 🙂 I hope Jandy Nelson comes out with a new book soon! I need to read this one. I keep hearing wonderful things about it. Michelle, I hope you get to pick this up soon! It’s a lovely book and I’d love to see what you think of it.